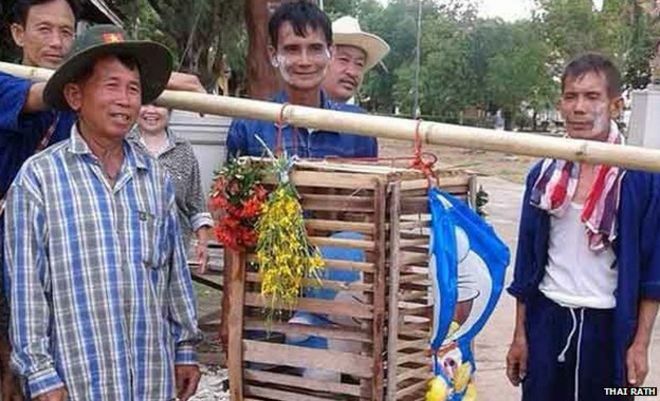 Farmers in the drought-hit Nong Muang Khai district of Thaliand traditionally place a live black cat in a box and carry it around several religious sites to pray for rain. Although the cat isn’t harmed in the ritual, the farmers were worried about the impact of social media and accusations of cruelty. So they decided to use a toy cat as a substitute. Unfortunately, after an extensive search of the village, the only toy cat found was based on the Japanese anime cat Doraemon. From Wikipedia: Doraemon (Japanese: ドラえもん) is a Japanese manga series written and illustrated by the manga writing team Fujiko Fujio. The series has also been adapted into a successful anime series and media franchise. The story revolves around a robotic cat named Doraemon, who travels back in time from the 22nd century to aid a pre-teen boy named Nobita Nobi (野比のび太 Nobi Nobita? ).